By joining as a 'Friend of Nottingham Heritage Vehicles Charity' you will be showing your support for a collection of local vehicles and thus helping towards ensuring a little of our transport heritage remains for the enjoyment of future generations. Being a member of the "Friends of NHV does not necessarily mean getting your hands dirty - its simply a way of being more in touch with our month by month activities and at the same time getting something back for your kind support. Preserving our transport heritage is our primary aim. Members of "Friends of NHV' help make this possible. Although we have been actively fundraising for many years with rising costs we need to look to the longer term in terms of sustaining and growing the collection. In addition we now need to develop the volunteer helpers towards restoring the building and developing the transport museum. Thus we have established "The friends of NHV". - A quarterly online newsletter on the groups progress and other relevant news, with the most recent edition being accessible via the members section of the website after inputting your password. - An invite to all our open doors days along with our 'members only' days giving you a fantastic opportunity to see all that goes on behind the scenes. - An invite to join us for a free 'members day out' during August 2016. - 10 % discount on all photographic purchases from our supporters at ukbusphotos photo sales stall at all transport events during the rally season (on production of your membership card - to be issued late April 2016). - Plus, for those wishing to get a little more involved with the day to day restoration, photographic archiving and fundraising requirements - the chance to become an active working helper, joining working parties on Saturdays and some weekdays throughout the year. All this for just £25 a year. 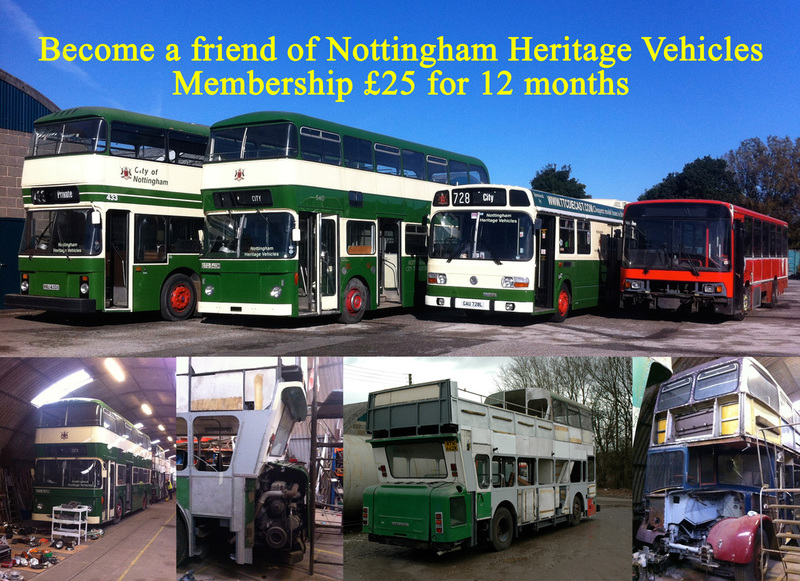 If you wish to become a friend of Nottingham Heritage Vehicles Charity please click the button below to pay your subscription for the next 12 months. Your membership card and further details along with your sales discount card from ukbusphotos will then be forwarded to you.